Hercule-progres Turbine is a photograph by Science Photo Library which was uploaded on July 24th, 2016. 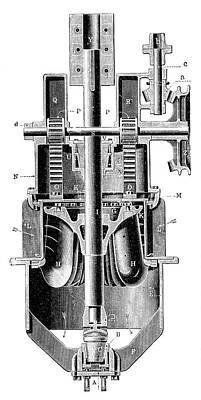 Hercule-Progres turbine. 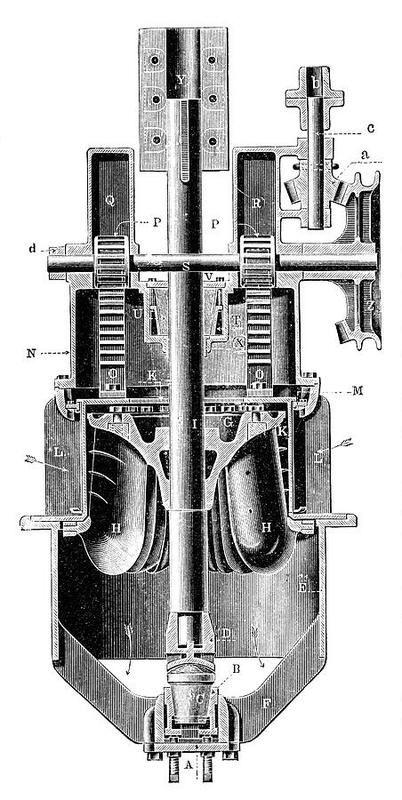 Historical illustration of a vertical section through a US-French Hercule-Progres design of water turbine. Water turbines harness the power of moving water as it rotates the blades (lower centre). A variety of designs were developed in the 19th century. This one had a guaranteed efficiency of between 80 and 85 percent. 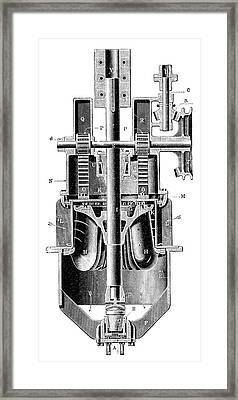 Artwork from 'Moteurs' (1911) by French civil engineer Max de Nansouty (1854-1913), part of the 'Les merveilles de la science' series of 1867-1891 by Louis Figuier. There are no comments for Hercule-progres Turbine. Click here to post the first comment.